Story added: 05 Jul 2004 19:00. Last updated: 06 Sep 2004 21:57. Samsung has unveiled a uniquely designed 3D Game Phone that uses the company's established clamshell design. MobileGameFaqs has been waiting for a phone like this for ages; lets hope its good! 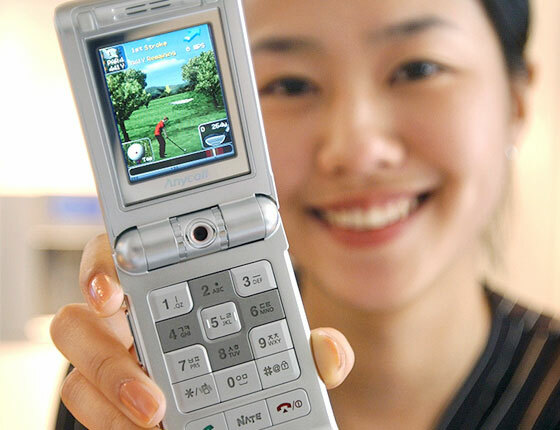 The keypad for functions such as menu and ok extends out when the phone is closed making it easier to use than conventional folder-type phones. The V450 also offers users a joystick on the extension for a more real and convenient mobile gaming experience. In addition, users are able to extend the memory storage by inserting a memory card into a slot that is on the side of the phone. Upon purchase, the phone comes with a 32MB Memory Stick Duo. The V450 allows users to play MP3 files without opening the folder as all command functions are on the extended keypad. While playing music, users are able to control several functions like pause, skip, revival and random choice, and alter the screen image that suits the mood and speed of the music. With the V450, users are able to record up to 2 and half hours of images as well as send images by phone.